Better late than never? Herbicide spray windows are closing but some fields still have major weed issues. Does the yield risk from herbicide damage outweigh the yield benefit from zapping that weed competition? Plane truth. You have to knock back those weeds, and now. Sometimes that means hiring a plane when field conditions are just too soggy for your ground sprayer. Weevil nets. 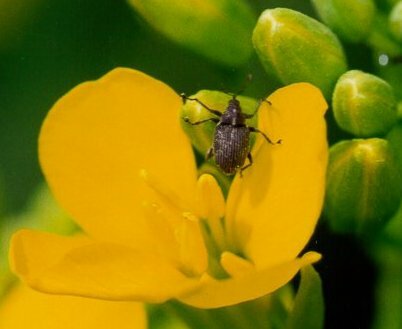 Wait until 20% flowering to spray cabbage seedpod weevil, and only spray if thresholds are reached. Got your sweep net ready? Sclerotia depots. 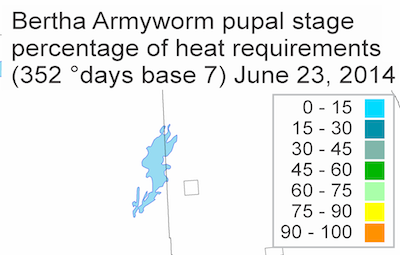 AAFC in Saskatchewan has 67 depots across the province to monitor apothecia emergence. These depots will assist growers with their sclerotinia stem rot risk assessment. 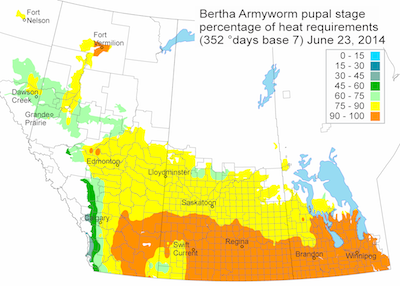 This map from Agriculture and Agri-Food Canada shows the regions where growing degree days (Base 7°C) have reached sufficient levels to trigger emergence of bertha armyworm adults from pupae. Adults will start emerging in orange areas. As adults emerge, they will start showing up in traps all across the Prairies. Keep tabs on cumulative adult counts over the next weeks as an indicator of potential risk in your area. Egg laying takes place shortly after adult emergence, and then it takes about 4-6 weeks for the larvae to mature to the most damaging instars. What nutrient does this plant need? The quiz this week is about identifying and treated nutrient deficiencies. 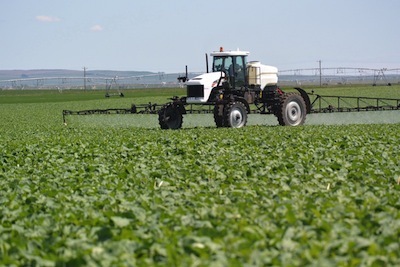 —If growers use canola as a clean up crop for Group-1 resistant wild oats, narrow-leaved hawk’s beard, round-leaved mallow and other tough weeds, a second herbicide application may be required to do the job. —If weeds are plentiful, at the same stage or ahead of the crop and the canopy hasn’t closed, these weeds may have a large yield impact. Note however that you’re still required to follow label rate directions even if these large weeds might require a higher rate for control. A pre-harvest product is another option to consider. —If weeds are at levels too low to influence yield, but are potential grade impacting weeds — such as cleavers (shown above) — a second spray may pay off if it can do a job on these weeds. 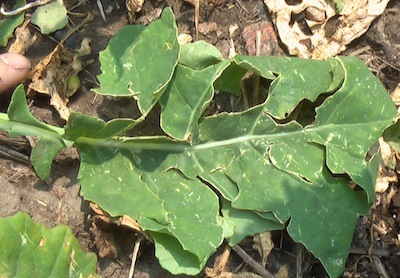 Scientists at Agriculture and Agri-Food Canada are testing an early warning system for sclerotinia in canola. The project is in its first year and involves 35 volunteers in Saskatchewan monitoring the emergence of apothecia in 67 sclerotia depots across the province. Each depot consists of 50 sclerotia (fungal resting bodies) buried at the soil surface. Sclerotia in the depots are expected to germinate at a similar rate as the thousands of sclerotia naturally occurring in the soil (as a result of past sclerotinia white mould incidence). The volunteers report percent sclerotia germination two to three times per week when the canola is flowering. Sclerotia germination data from all depots are available on SaskCanola’s website (www.saskcanola.com). Click on the “Percent sclerotia germination map” icon. The provincial map can be moved in all directions and zoomed in or out. We had a “follow up question” to last week’s article “Hail damage: Economic loss depends on cro stage.” The grower was asking about foliar nutrition after a hail storm. He had 2” of rain a week after a hailstorm and he feels that a foliar application could be worthwhile. The hail hit canola at the 5-6 leaf stage with a lot of main stem breakage. 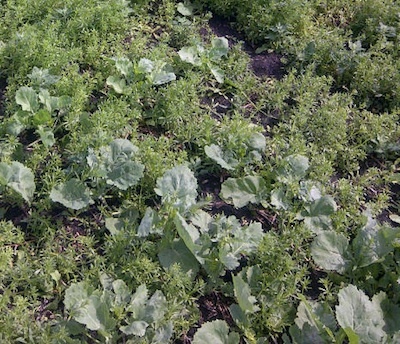 The grower asked for any other information on hailed canola and what he can do to help it recover. Want to see how a foliar nutrient application helps a hailed crop? Leave a check strip. Want to see whether a novel treatment provided a return on investment? Leave a check strip. Growers can use strip trials on their own farms to test how a particular practice or product performs in a local environment. This information can then be used to help decide whether it may be worthwhile to try this new practice or product on a larger proportion of the farm, and to target it at acres with the greatest likelihood of success.